Officials following the signing of the deal. The Government of Ras Al Khaimah today completed a deal with India’s Shree Cement under which the latter has acquired the emirate’s Union Cement Company (UCC). The Foreign Direct Investment (FDI) deal has been completed exactly six months after the initial announcement in January. The transaction was managed on behalf of the government by the Investment and Development Office (IDO) of Ras Al Khaimah. Established in 1972, UCC is one of the leading cement manufacturers in the UAE. Prior to theacquisition by Shree Cement, UCC was a listed company on the Abu Dhabi Securities Exchange (ADX). It has now been de-listed from ADX and converted into a private joint stock company. 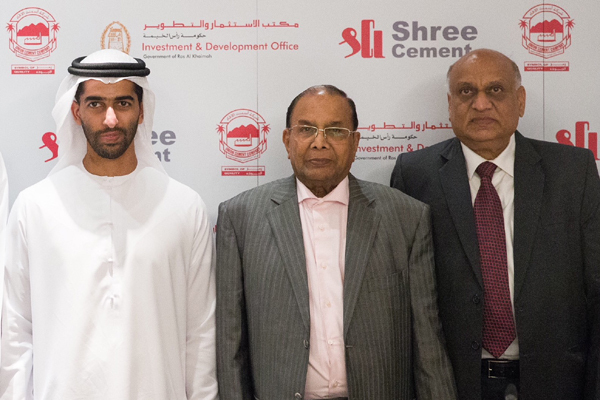 The purchase marks Shree Cement’s first foray into overseas markets, with the emirate providing it a strategic location from which to grow business across export markets in the Arabian Gulf, Middle East and East Africa. Shree Cement’s commitment to continue to invest in the growth of UCC operations and resources played a pivotal role in the government’s decision to pursue the deal, said a statement. UCC has a clinker capacity of 3.30 million tonnes per annum (MTPA) and cement capacity of 4.00 MTPA and it deals with a variety of types of cement including ordinary portland cement, sulphate resisting cement and oil-well cement.